Recent lawsuits alleging the use of “outdated” mortality tables when calculating benefits payable in annuity distributions or at early retirement could be part of a new trend that poses a threat to defined benefit (DB) plans, according to one law firm’s employee benefits practice. Four lawsuits filed in federal district courts against large corporate pension plans late in 2018 alleged that this practice has caused participants and survivor annuitants to receive lower payments than required under the Employee Retirement Security Income Act of 1974 (ERISA). The similarities among the suits, filed by the same two law firms, suggest that additional lawsuits against other large pension plan sponsors may soon follow, said Groom Law Group in a client bulletin posted at the end of last year. The four putative class actions were filed by current or retired employees of American Airlines Inc., Metropolitan Life Insurance Co., PepsiCo Inc. and US Bancorp. The companies’ benefits committees were also named as defendants. The suits focus on the joint and survivor annuities or early-retirement benefits available in these companies’ DB plans. These annuities provide reduced benefits to retired participants while they are alive, in exchange for the continuation of pension payments to the participants’ spouses after participants’ death. The plaintiffs allege that the pension plans used actuarial equivalence factors that were decades old to calculate the payment amounts under given alternative joint and survivor annuities and, in one case, early-retirement benefits. Two of the cases focus on the specific mortality table designated in the plan document for that purpose—in one case, the table was from 1971, and in another, the table was from 1984. “Older mortality tables predict that people will die at a faster rate than current mortality tables,” the plaintiffs allege, causing the reductions applied to participant benefits to be overstated. These lawsuits acknowledge that the plans’ stated mortality and interest assumptions “must be viewed together to determine if they produce a reasonable, and equivalent, benefit,” according to Groom’s bulletin. In the cases in which the plans had a fixed interest rate, the complaints indicate that the stated rate, by itself, was reasonable but, taken together, the mortality and interest rates were unreasonable. The suits do not say when the combined factors first became unreasonable. While mortality tables and interest rates have been updated under federal pension law over the years for various purposes, such as pension minimum funding and minimum lump-sum payment calculations, there have been no required updates in the context of these joint and survivor annuity calculations. Specifically, the cases claim that the plan fiduciaries breached their ERISA fiduciary duties by relying on the allegedly outdated mortality tables because they have “unreasonable conversion factors that do not provide for actuarially equivalent options,” resulting “in participants and beneficiaries illegally forfeiting and losing vested benefits,” the Groom bulletin stated. “Many older pension plans still utilize factors that were adopted decades ago. 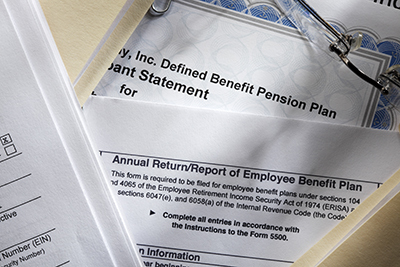 This practice maintains the original design of the plan and may be consistent with a general desire not to make changes, especially for pension plans with traditional benefit formulas that have been frozen or phased out in favor of a different retirement program for the current workforce,” the bulletin explained. Smith v. U.S. Bancorp, 0:18-cv-03405 (C.D. Minn. Dec. 14, 2018).